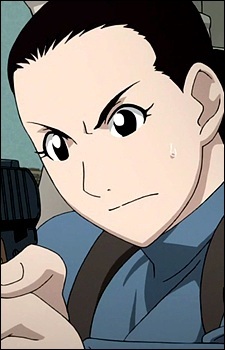 Second Lieutenant Rebecca Catalina is a soldier under the command of Lieutenant General Grumman at the East City Headquarters and a close friend of Riza Hawkeye. Though an exceptionally skilled soldier with combat abilities on par with Hawkeye and Havoc, Rebecca's true ambitions appear to lie with in the marital realm, as she spends much of her time complaining about her single life and trying to get Riza to help her find a man. She declares, after Hawkeye mocks her, that she hopes to "land a real hunk and retire early" from the military.